Selecting a Senior housing community – easy for some, not for the rest of us. Even if you think you will never move into a Senior housing facility you should at least do some research so that in an emergent situation, you’ll be well-enough informed to start moving forward with a plan. This is not the time to be making snap decisions. Your well-being, or that of a loved one, deserves more attention than that. Making an advanced decision, and thinking ahead regarding future living circumstances, will afford you the opportunity to make a decision that you want, not what others have decided for you. What follows may be too basic for those who are already familiar with Senior housing options, but for many, this blog entry will serve as a first step primer towards getting ones’ feet wet. INDEPENDENT LIVING – sometimes called After 55 Housing. These complexes are designed for adults who want an independent lifestyle in which they can relinquish yardwork and house maintenance tasks to someone else. Now you’re talking! If the independent complex has a common dining room they will either provide meals in a restaurant setting (ordering off the menu) and/or buffet-style selections. Depending upon the particular independent community you’re considering, other amenities such as housekeeping, transportation and on and off-site activities may also be available to its residents. It’s important to know that although these communities may offer wellness programs in which you can become involved, e.g. exercise or nutrition classes, there are typically no care options offered unless the community is licensed as a residential care facility for the elderly. This category of facility promotes independence while also offering personal assistance for specific care needs such as bathing & toileting, dressing, walking assistance, and/or medication assistance. These needs are called Activities of Daily Living (ADLs). Assisted living communities may be a stand-alone building or an extension of an independent residential community. If an assisted living facility is also licensed to provide dementia/memory care, a resident could readily move from general assisted living care to dementia care in the same facility. An Adult Family Home is typically a single family home with a State-imposed maximum allowable number of residents – in Washington State, this number is six. These residences offer assistance with ADLs. This is a desirable option for those looking for a residential situation that is more home-like than facility-like. Many adult family homes also provide specialized care for those with dementia. These facilities provide all the expected assisted living services plus specialized services that meet the needs of the memory impaired adult and is usually always a secured unit to protect a resident who might be a wandering risk. By secured, I mean that in order to exit to a public hallway or common area, such as a lobby, a person would need to punch a code into a keypad that one with dementia would most likely not be able to navigate. A secure dementia care unit can exist as a stand-alone building or can be found within an assisted living complex, a nursing home complex, or a continuing care retirement community. NURSING HOME/SKILLED NURSING FACILITY/REHABILITATION FACILITY. This facility provides 24-hour medical care on a short-term or long-term basis. Additionally, rehabilitation programs are offered. If someone living in an assisted living community has orthopedic surgery, he would probably undergo a certain amount of rehabilitation at a nursing home and then return to his previous residential situation. A nursing home can sometimes become a permanent care option for those requiring a higher level of care. Since assisted living and dementia care facilities have certain limits on the level of care they can provide, a nursing home may be necessary in order to receive the advanced care needed by a resident. A CCRC has all levels of Senior living – therefore it’s usually quite expensive: independent, assisted, dementia care and nursing home care. The benefit of a Continuing Care Retirement Community is that you can age in place regardless of your growing medical or cognitive needs. This type of community exists on a larger campus that truly does provide an entire spectrum of care. You can move into a CCRC totally independent – without any care needs whatsoever – and gradually move through the campus property without leaving your friends and without greatly changing your surroundings, thus assuring a continuum of experience for many years to come. Housing for Seniors is addressed in the attached Federal Seniors Resource website that provides an extensive list of pertinent resources. I hope you’ll find it helpful – not just for senior housing information but for many topics about which you may have an interest. 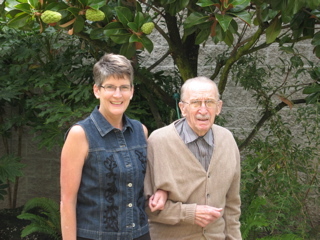 My wonderful dad and I taking a stroll in 2006. What challenges have you faced – or what concerns do you have about either your future or the future of a loved one who might need Senior housing? Let’s talk about it – let us hope that what each of us contributes benefits those tuning into this blog. This entry was posted in Caregiving, Senior Housing and tagged Alzheimer's, assisted living, dementia care, senior housing options. Three Sisters – a humorous look at memory challenges. Three sisters, ages 92, 94, and 96 lived together in a large, rambling house in Asheville, North Carolina. One night, the 96-year-old was drawing a bath. She put her foot in and paused. She shouted to her two sisters, “Was I getting in or out of the bath? This entry was posted in Fun and Games and tagged humor, memory challenges. Navigating the maze of long-term care housing choices. The most comfortable decisions you can make in life are well-informed ones. Whether you are choosing a vehicle, the vacation of a lifetime, or a potential residence, doing so is made easier when you’re armed with essential information. Oftentimes when inundated with too many choices, we exclaim that we would rather have fewer options from which to choose. “Give me two choices and I’ll be able to decide – six or more? Forgetaboutit!” There is one time, however, when you will welcome a diversity of options: selecting appropriate care in your Senior years. Identifying the person in need of care. 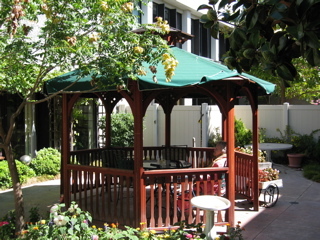 Gazebo at dementia unit where my father lived. This quest upon which you are embarking may be your own personal quest. You know staying in your current home might prove dangerous to you – and therefore inadvisable – in the years to come. Or perhaps you just want to retire from doing house repairs and weekend yard work –and who doesn’t? Whatever the reason, you’re considering your options for when you might be less able to take care of your daily needs. Another scenario is that your spouse, parent or sibling is in need of some sort of long-term care resultant from a debilitating condition such as cognitive decline, mobility restrictions and/or advancing age, so you’re trying to discern how best to address the care needs associated with their condition. Aging in Place – This blog posting addresses the option of staying put and making adjustments that modify a residence to suit your needs or that of your loved one. Also included in this option is the potential for hiring in-home care. Both of these options allow a person to remain in their home for as long as possible. Long-term care (LTC) housing options. In a future posting I will address the available categories of long-term care (LTC) housing and will provide resources that should be helpful towards choosing a replacement for your current residential situation. Both options have Pros and Cons involved with them. But only you know what best fits your personal situation. Aging in Place: I don’t even want to think about moving! Aging in Place refers to living where you have lived for many years using products, services and conveniences to enable you to remain where you are. To successfully age in place without moving you will most likely need to accommodate the physical and cognitive changes that may accompany aging. Structural changes. Both the inside and outside of the home could eventually require some structural adjustments to accommodate a person’s current – and future – needs. If you live in a two-story house and your primary bedroom and bathroom are upstairs, does your bottom floor afford a bedroom/bathroom alternative? Are you financially prepared for the costs of making the inside of your home more accessible, e.g. wider doors for wheelchairs or walkers; lowered counters to accommodate same; showers that can accommodate someone confined to a mobility aid? Does the outside of your home allow for the addition of ramps and railings for easier access to the residence? If one of you has cognitive decline and is prone to wandering outside of the house – what measures, if any, will assure this resident’s safety? If you need care assistance during the day, are you comfortable having a health care provider in the home? The costs and logistics of hiring and scheduling staff to come into your home can prove to be overwhelming and oftentimes more expensive than if a person moved into a residential community that readily offers the needed care. How expensive is in-home care these days? Caveat: I will not be addressing financing sources such as long-term care insurance, Medicare, Medicaid and the like. My intent in these articles is simply to provide an overview of care options and potential costs. The U.S. Department of Health and Human Services gives a 2009 run-down on costs for care options both in the home and in a long-term care residential setting. I know that in Washington State, where I reside, the average Home Health Aide hourly rate is $22; the average monthly cost of an Assisted Living (AL) facility is $2870; and the average daily cost of a semi-private room in a nursing home is $225 which is approximately $6700/month. Focusing on Home Health Aide/In-home care: based on the average hourly rate of $22, one could expect to pay close to $528 per day if based on an hourly rate. Keep in mind, however, that most staffing agencies offer a monthly rate which will be less than the hourly rate. But even with that “discounted” rate, in-home care can be very cost prohibitive. A great many of us may not have access to that amount of cash and if the need extends out to several years – now it’s really adding up. So why even think of remaining in one’s own home if it’s so %#^%($ expensive? All of the above is not to suggest that Aging in Place is not doable. Many people around the nation are successfully aging in place so why shouldn’t you have a crack at it? Consider this alternative: some people start out Aging in Place and then transition into a long-term care housing situation when finances, or circumstances, warrant such a move. The articles, Avoiding the pitfalls of selecting senior housing, and Selecting a senior housing community – easy for some, not for the rest of us, provide some tips for your selection process. Some links of interest: Alzheimer’s Association Carefinder service; Leading Age; Federal Govt Senior Topics. This entry was posted in Caregiving and tagged aging, aging in place, assisted living, Baby Boomers, in-home care, long-term care, nursing homes. I’m a Baby Boomer – are you one too? No doubt you have already faced some challenges in your 21st Century age grouping called: Baby Boomers. I think you’ll agree, however, that along with those challenges we’ve also experienced delightful times that can only be experienced by us Boomers fortunate to have grown up in the 1960’s and 1970’s. My hope in starting this blog is that you and I will be able to provide some sort of content that benefits our age group, but not our age group only. Let’s face it, our children and/or our grandchildren need some sort of resource that adds to their understanding of what we’re going through. They too will enter a Baby Boomer-Like age grouping when they reach our age so perhaps we’re doing them a favor by getting their feet wet in this wacky aging world in which we live. Some of this blog’s content will be humorous; some of it will be inordinately sad. My hope is that one way or another, we’ll all be better off because we’ve entered this “Baby Boomers and More” blog site. This entry was posted in Blogging, Uncategorized and tagged aging, Baby Boomers, Boomers.